Despite concerns prior to the event, ITMA 2015 was a success. There were some reservations leading up to ITMA 2015 — which was held in Milan, Italy, November 12-19, 2015 — about just how successful the event would be. Concerns about global economic uncertainties, especially the growth rate of China’s gross domestic product; the timing of the show with it occurring so late in the year; and questions about the value of an ITMA in Europe today all swirled around show preparations. But despite all the reservations and concern before the event, ITMA was a resounding success. The halls were busy for the entire show, and seemed to be full of excitement and energy. Many exhibitors reported their booths were constantly busy with high-level customers during the show, and many exhibitors were happy to report strong sales during and after the show. At 10 a.m. on the first day, visitors were lining up to enter the Fiera Milano Rho. Photograph courtesy of ITMA 2015. The success of the show was confirmed by the post-show numbers released by the show’s owners the European Committee of Textile Machinery Manufacturers (CEMATEX), and organizers Singapore-based MP Expositions Pte. Ltd. The show hosted the largest number of exhibitors since its inception in 1951. 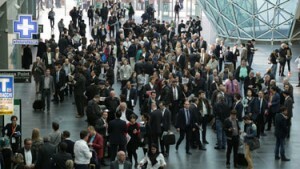 Some 1,691 exhibitors participated from 46 countries and economies, which breaks the previous record of 1,451 exhibitors set in 2007 at ITMA in Munich, Germany. Net floor space totaled 108,000 square meters and covered 11 halls at the Fiera Milano Rho fairgrounds in Milan. The total exhibit space was approximately 20-percent larger than floor space at ITMA 2011. Exhibitors from Europe occupied by far the largest amount of floorspace at the show with 69-percent of the total net exhibit space. Of those exhibitors, 453 Italy-based companies occupied 32,540 square meters of floorspace and the 238 Germany-based companies booked 21,380 square meters of exhibit space. From outside of Europe, companies from Turkey, China, India and Japan booked the greatest amount of floorspace. Visitor numbers also were impressive during the eight-day event. The show attracted approximately 123,000 visitors from 147 economies, which was an increase of 20-percent compared to numbers recorded in 2011. The visitors also were reported to be high-quality attendees. “We registered a 20-percent jump in visitors numbers compared with ITMA 2011,” said Beauduin. “More importantly, from participants’ feedback, we can confidently say that this is one of the best ITMA exhibitions! Our message on sustainability has resonated greatly with buyers. ITMA’s theme, was “Master the Art of Sustainable Innovation.” Exhibitors certainly embraced the theme, and much of the technology presented at the show offered some sort of energy, costs and materials savings all contributing to more sustainable production. Textile World will have more in-depth coverage of the various technologies on display at ITMA in the next few issues. Spinning and knitting technologies appear in this issue; and wet processing, nonwovens, digital printing and weaving will be covered in future issues. The busy booths suggested that a lot of business was taking place, and reports from exhibitors confirmed just as much. Exhibitors also used the occasion to share news and celebrate milestones. Erwin Devloo, marketing communications manager, Belgium-based weaving machine manufacturer Picanol NV, reported the company had sold more machines in one day at the show than ever before. After the show, Switzerland-based Oerlikon’s Manmade Fibers Segment received a number of large orders worth approximately $50 million for its Oerlikon Neumag staple fiber plant engineering technologies. The Netherlands-based SPG Prints hosted a press conference to introduce its Pike® single-pass digital printing machine featuring Archer® technology. After the show, the new machine was heading to customer Germany-based KBC Fashion GmbH. Germany-based LTG AG was at the show promoting a new compact drum filter that can be shipped completely assembled. The company also was celebrating its 90th anniversary. Gerhard Seyffer, president, LTG Inc., Spartanburg, S.C., said the quantity of visitors was very good during the show, and the company sold some equipment. Switzerland-based Bräcker AG used ITMA to celebrate the company’s 180th anniversary. Daniel Link, managing director, underlined the success of the company and its products and recalled some of the history during a celebration at the company’s booth. announcing that the company had reached a milestone during 2015 — selling its 50,000th carding machine. 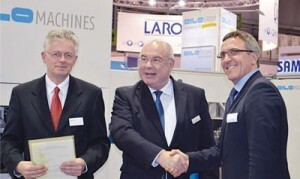 (left to right): Prof. Dr. Stefan Schlichter, Johann Philipp Dilo and Prof. Dr. Thomas Gries, with the compact line the DiloGroup presented to Institut für Textiltechnik Ausburg gGmbh for research purposes. Germany-based DiloGroup CEO Johann Philipp Dilo signed over a state-of-the-art universal compact line for needling recycled carbon fiber that was on display in the booth to the Institut für Textiltechnik Ausburg gGmbh. The line includes material storage and feeding, carding and stackers, needle machine and winder. The generous donation will be used to advance carbon fiber research, and Dilo said the machine will get more use at the institute than if it was at a Dilo facility. DiloGroup reported initiating a large number of new projects as well as receiving numerous orders for deliveries during ITMA. At a press conference hosted by China High-Tech Group Corp., parent company of Fong’s Industries, Roland Hampel, joint managing director of Germany-based A. Monforts Textilmaschinen GmbH & Co. KG announced the company had acquired the know-how of Austria-based Timatec Corp. Timatec specializes in coating and has a wide portfolio of coating equipment — including knife-over-air, knife-over-roller, magnetic roller and printing-head coating options — that now will be manufactured at the Monforts Montex plant in Austria. MS Printing Solutions hosted a special “Transparent as Water” debate centered on sustainability. The event explored sustainability and the associated sociological and cultural implications and featured Francesco Morace, a sociologist and essayist who worked in social and market research for more than 30 years; Piero Formica, an economist, professor and founder of the International Entrepreneurship Academy; and Giuseppe Miroglio, president of Italy-based textile printing company Miroglio Group. This is just a small slice of the events, happenings and business that took place during ITMA. CEMATEX announced that ITMA will return to Barcelona in June 2019. A somewhat surprising choice, given that the city hosted the event in 2011, and Munich was considered the front-runner. However, participants were happy with Barcelona as a venue, and the industry looks forward to another record-breaking show.